The Closter Nature Center is proud to offer its annual summer camp program to children ages 4 – 14. 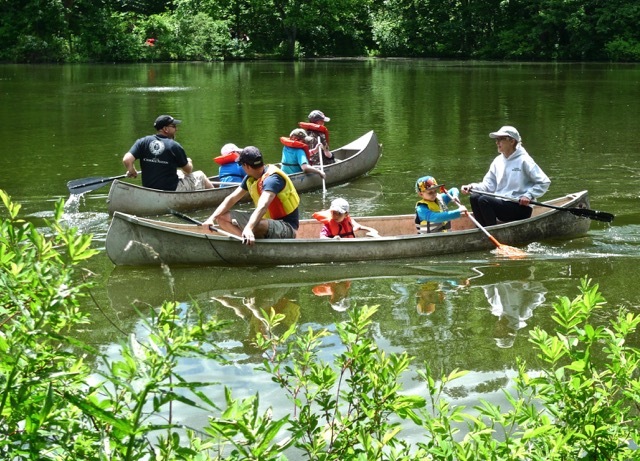 For over 45 years, campers have had an opportunity to explore the Nature Center’s 136 acres of ponds, streams, meadows and forests in a fun and nurturing environment. Our campers hike, dig, wade in the water, and examine nature, all under the supervision of a trained naturalist and an assistant. The 2019 summer program will begin on June 24th and continue for 9, possibly 10 weeks ending either August 22nd or 29th. Camp sessions will be either morning or afternoon, Monday through Thursday. Campers can sign up for one or more 4-day weeks. Each weekly program will offer different activities suitable to the age group, children’s interests and the weather. Campers ages 4 – 6 will meet each day for 2-hours, with weekly fees of $80 for members, $100 for non-members. Campers ages 7 – 11, and 12-14 meet for 3-hours each day, with weekly fees of $100 for members, $120 for non-members. To register online please click the blue button below and you will be taken to Community Pass, our online registration and payment system. All summer program registrations will be done through Community Pass whether you are paying by check, credit card or via PayPal. As the summer progresses, classes will fill up. Don't delay, SIGN UP TODAY! The Closter Nature Center is a 501c3 non-profit organization. A peaceful oasis in the middle of suburban Closter, New Jersey we are dedicated to the preservation of our natural environment through exploration and education.